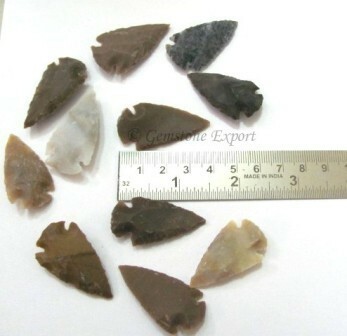 Gemstone Export - one the Leading Manufacturer and Exporter of Indian Arrowheads 2.00 Inch to 2.50 Inch, Give us call on +91-9898796674 for best prices. This products can be customized as per your preference for logo and design. Kindly Go at our Website : www.gemstoneexport.com. Our experts always makes effort to bring the most unique and dynamic stones in different shapes, colors, textures and sizes. Apart from the loose stones, we also cut them with our advanced machines to give them unique features. If you want, we can also make wonderful products with them like keychains, healing wands or chakra jewelries. As a result, your purposes will be served, and you will always get the best. Nothing is better than this. Therefore, it is high time to check out what choices and collections we have in store for you.